We’ve lost more than our fair share of birds over the years to a variety of predators, so I am thrilled to be welcoming Kathleen of Yankee Homestead to the blog today– you are going to love her practical tips and detailed tutorial for building a chicken run of your own! …Then I’m sure you know the heartbreak of raising chicks to adulthood, only to have them nabbed by a predator just when they’ve started laying eggs. 1. Determine the dimensions of your run. The chicken coop was already located near the garden. The garden was already enclosed with a wire fence to keep out deer. We were banking on the added bonus of bug control for the garden. To protect against hawks, a good width for your run is about four feet. Even when the run is left uncovered, a hawk will not land in such a narrow space. Be sure to designate space for a gate! Make sure your chicken coop is even with one side of the run. The existing fence around our vegetable garden was built from 4×8 wooden posts and 2×4 14 GA welded wire fence. We chose to use the same fencing for the chicken run, with T-posts for the additional supports. If you’re building a chicken run from scratch, choose the material that best suits your needs. Note: Regular chicken wire will not keep out predators. Unfortunately, even the 14 GA welded wire fence of our own chicken run did not keep out raccoons. They can reach right through the openings to kill a chicken. The solution is to add a strip of hardware cloth (or some sort of metal fencing with very small holes, no larger than ½”) along the bottom of the run. Theoretically you could build the entire run out of hardware cloth, but it’s pretty pricey. A more economical option is to build the run out of a less expensive material and use the hardware cloth along the bottom of the run. 3. Space posts about every six feet. For 8’ wooden posts, use a post hole digger to dig a 2’ hole. Place the post in the hole, fill with dirt and pack with a tamper. For 7’ T-posts, hammer in with a T-post driver (like this). 4. Roll out the fence. Roll it out along the entire path you’ve created with the posts. Be sure to roll it out completely in front of the coop. 5. Attach the fence to the posts. Before attaching to the posts, make sure the fence is at ground level along the entire path. For additional security against digging predators, make a trench and bury the fence about 6-12 inches deep. When the fence is positioned correctly, wrap one end around the first post and use zip ties to hold it in place. Pull the fence tight along the rest of the posts and wrap the other end around the last post, securing with zip ties. We chose to leave the zip ties attached permanently for added stability. Check to make sure you’re happy with the fence position all the way around your run. Use 3/4” poultry staples to attach the fence to wooden posts or pieces of wire to attach to T-posts. For added protection, attach hardware cloth or similar fencing along the bottom of the fence. Note: most predators that are able to reach through regular fencing to nab a chicken will attack at night. If you want to avoid the cost of hardware cloth, another option is to lock up the chickens in the coop at night. 7. Cut out an opening for the coop. Use wire snips to cut an opening in the fence. Use wire and staples to attach the fence to the coop, as in #5. 8. Optional: cover the run. To deter climbing predators, cover the run with heavy duty C flex 80 round deer fencing and secure with zip ties. 9. Build (or purchase) and install a gate. *This should match the width of your finished gate. Remember to make your gate large enough to accommodate a wheel barrow or any equipment you’ll need to use inside the run. Our gate is 3’ wide. 1. Measure, mark and cut the 2x4s for the gate’s frame. 2. Connect the three shorter 2x4s to the 2 longer 2x4s with 2″ to 3” wood screws inserted at an angle. 3. Attach eight L-brackets to give the gate more stability. We used only four. In hind sight my husband recommends bracing each corner, which requires eight brackets. 4. Measure, mark and cut the 1×4 to fit diagonally across the gate from top to bottom. Attach to gate frame with 1/2″ screws (one at the top, one at the bottom and one in the middle). 5. Hang the gate with three gate hinges of your choice. 6. Attach a latch choice on the outside of the gate. Our latch is similar to this one. It may be necessary to add a small piece of wood to support the latch. 7. Use wire snips to cut a small opening beside the latch. This will allow you to operate the latch from inside the run. 8. It’s a tiny bit hillbilly, but we used what we had on hand–weather stripping secured with zip ties–to line the sharp edges of the opening in the wire. This protects our hands from getting scratched! And that’s it! We’ve been so pleased with our simple chicken run. Which predators cause the most trouble for your backyard chickens? How do you protect your flock? Have you tried a chicken run? Kathleen Henderson lives on a few acres in Northern Virginia, where she keeps up with Mr. Native Texan, three busy boys, an assortment of chickens and an organic garden. She blogs about healthy living at yankeehomestead.com, providing time-saving resources for naturally-minded mamas. YOUTUBE + A Mad Mama Hen! 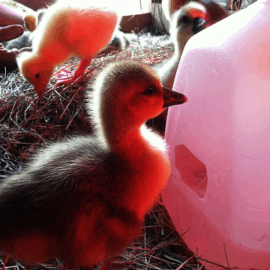 How to Butcher a Chicken DIY Waterer for Ducks and Geese Do I HAVE to Have a Rooster? I just saw your blog on making beeswax candles. I noticed you used medium sized wicks–did the candle burn evenly? tunnel? burn too quickly? From that post, have you changed the size of the wicks? (I’ve been reading that beeswax tends to burn slowly, so wick size is imperative to get the most use from the wax.) Thank you! Hi Kimberly– the wicks seemed to work well. Haven’t had a need to change it yet. Great! We haven’t yet jumped into chickens, but this makes it seem more do-able. Predators will definitely be an issue for us! Kathleen, can you share the plans for the chicken coop as well? I love the whole rustic, use-what-you -have approach and how you incorporated it with your garden. Absolutely love it all! You’ve given me great ideas. Hello – we are in Western Montana and have a small ranch. Our chicken predators include bears, bobcats and for about a month, magpies and crows. I had field fence over the top of my chicken yard but the birds became too agile of fliers and would zoom right through, and the bobcats are like monkeys; they would climb the trees, tiptoes out on to the cross boards and jump through. Smaller-holed wire will just catch the snow and collapse. Bears just plow right though anything except for hotwire! Last winter the snows brought down some trees right onto my yard so I am rebuilding and revamping my chicken yard and run. I too, have our garden close to the chickens so I am going to make a “hallway”/run for them. Great idea – thank you – spring blessings! This comment is about your “Breaking Homesteading Stereotypes” post. I would have commented there, but had a little trouble finding the comments section. I’m 53 years old and spent the first 30 years of my life caring a lot about what people thought of me so I could fit in and be accepted. One day when my kids were young, one of my neighbors told me I was a bad mother because I was too strict with my kids. ON THE SAME DAY, my other neighbor told me I was too lenient with my kids! I decided then and there that I had to do what I thought was right regardless of what people thought of me. Homesteading, mothering, wifing (wife-ing), whatever . . . I care what Jesus thinks of me. I care what my husband and children think of me. I obey my employer and serve those around me, but what they “think of me” stays in the outer chamber. I’m glad that you’ve come to that place in your journey where you can objectively evaluate negative comments. Be yourself, offer what you have to give, enjoy your freedom to live! That’s my comment. BTW, my kids are now wonderful, kind, loving and serving the Lord adults. Not because of me, but because the Lord is good and merciful. AND we sometimes eat popcorn for supper, love our dishwasher, and watch shows on screens! Way to go Heather! Thank you for sharing your thoughts. We made a big run for our chickens, a big pen really, we had to cover the top or the raccoons could still get them since they were a problem for us as well as the hawks. I have one chicken who survived a Hawk attack after getting half of one of her legs and part of her breast eaten by the hawk. My son found her hiding in a window well as well as another dead chicken nearby. All the skin, and feathers of course, was totally gone, a 4″x6″ area. Pretty big on a little chicken. We healed her using essential oils (doTERRA) and other natural things and she is back to running around and laying eggs! We can send pictures if you are interested and share the protocol. So many people told us to kill her and put her out of her misery, but I looked at it as an opportunity to heal as if God said, “here, try out your skills, you can do it!” To do something on a small scale before being tested with anything larger in case of disaster or emergency. Wow! That’s amazing, Sally. Good for you (and her)! Sally Farb I would love your Portocal, txagsw@verizon.net!!! This chicken run looks great. I was wondering though, how do you keep digging predators from getting under the gate? I’ve seen a tutorial (from Pinterest maybe?) where they actually bury the bottom 8-12 inches of fencing (at a 90 degree angle?) to keep out digging predators. If digging down is difficult, bury fencing for a 15-inch width just beneath the surface of the soil, even under the gate. Predators usually will go up to a fence (or gate) and then try to dig down. They don’t (I hope) figure to back up a foot or two to begin digging. Also, we used concrete over foot-wide grid wall horizontal to the ground and it makes a nice mud free step into the run. For the gate, I think we dug a trench and filled it full of concrete. Now we have a nice concrete door step. It has worked wonderfully and basically the only predator problems we have had are when I forget to shut the door! What a great idea! We are very new chicken owners, and while we live in town (chickens in town is a gray legal area ;), we do still have our share of predators. With no larger fenced in yard, this would be a good way to let them out and about. 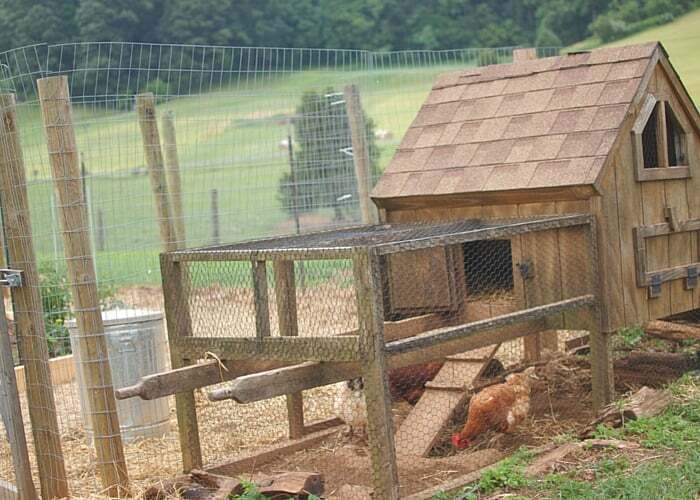 Your coop look similar to ours; I also like how your coop doesn’t open up to the “yard” until the fence begins. Our fence was around the coop and yard area, and our girls would fly up to the top of the lower section and then fly over the fence. Luckily, I saw them before the dogs did. An interesting idea! May I tell u about my almost 1,000 square foot enclosure for my 20+ girls. My 12’x16′ henhouse used to be my horse’s “stall?” It had an opening for him to come & go at will. Very nice for him with deep bedding and a good shelter. Attached was a small covered hay area, about 100 bales worth of storage. When I decided to get out of the horse end of things, I decided – again – on chickens. A bird of prey & judging by the timing, I feel an owl, destroyed 2 of my chickens before the overhead netting. The whole area is enclosed with wire on the sides and plastic netting overhead. We used 9′ posts to hold up the netting, buried 2′ each. They were cedar trees before becoming our posts & capped with various sizes of PVC end caps. That way, with the rounded smooth caps, the wire is not damaged, even when the wind blows. We also have hawks. In fact, for 2 days in a row the chickens have warned me they were here. But I had put in 2 “hawk poles.” They are 16′ tall & buried well, with an electric wire going up and over the top so a hawk gets his feet tickled when he lands. The guy the other day did not stay seated long 🙂 Since hawks are territorial, and he gets chases away from the chicken turnout, he will also chase other hawks away from this immediate area here. The henhouse has wire buried down from the foundation and I have an electric wire running all around fairly close to the ground for anybody who would like to dig in! We have coyotes bad around here but nothing has come through that hot wire. The girls can take shelter under their raspberry patch, their blackberries, their 2 mulberry trees, 3 bush cherries, a maypop & a sugar maple. Lots to peck at & also gives them lots of shade. But during the day, they also have 2 small rectangular doors that pull up for their going in and out of the henhouse at will where they have additional water (some outside too) & food. Then I have my door as well. When it gets cooler outside, my door stays closed, but in the heat of summer, I’ll just leave my big door open as well. That and the fan has kept them all right this year. The eggs just keep coming in. My last 8 pullets are starting up, as I got a little bitty egg this AM, along with big eggs from the older girls. All in all, they seem quite content & have plenty of green stuff & berries to pick at. Bugs beware! We’ve heard that electric wire is pretty much the best protection for a chicken run/coop. Sounds like you’ve got quite the set up, Kay! I let my chicks free range all over my yard during the day. We do have predators but I have an eight foot vinyl fence and lots of trees. There is a large fig tree with low branches and a stead of bamboo. We also have Guineas which keep a good look out. They have access to an enclosed run that is 8′ X 10′ which my son built for me. It has a roof, hardware cloth wire on all sides and a concrete floor with 2″ sand. Not even a mouse can get in. Since your chicks can not really free range, do you add greens and things to their run? On bad weather days when they stay in the run, I give mine greens, cabbage or leaves. On hot weather days I give them frozen peas or corn and some times watermelon. A warning on using zip ties. They are great for holding fencing in place while situating the hardware cloth onto the framework of the run, but please ALWAYS then add proper screws. We only had the zip ties to begin with and a predator chewed it off, opened up the hardware cloth, entered the run and proceeded to decimate (kill) all of my young flock except for one. She was smart enough to slip out and did not reappear until my husband went out to clean up the mess. What a smart girl she is! Anyway, thanks for sharing all the great info on building a chicken run. Aren’t chickens fun? They can be such clowns!! Has anyone tried the solar powered electric fence? I am wondering if this would help deter predators? I don’t know if they run all night on a charge. I really like tour blog and website. I jusr came acroos it. We have 2 Roosters soon to be adding chickens. I was looking at coops and runs on Pintrest and came across your blog. I’m so into honesteading and will be a regular! We’ll be building a coop and run and I love yours! Thanks for sharing! 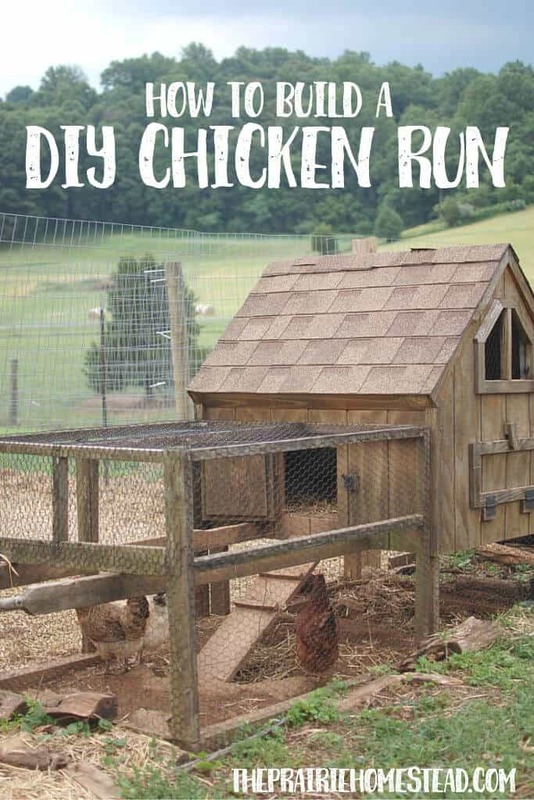 I am so excited to see your chicken run plans because it is exactly what I’m ALREADY building! I’m in central Florida, so I have an open air coop. Working from an old article in a certain magazine, I am enclosing the entire garden (off the coop) with the run. Imagine what you’ve done but double. The outer fence has one gate, but the inner fence will have two so that, when open, they will close off the run so I can enter the garden. If I leave them open I can actually have two separate flocks. I will use hot wire rather than hardware cloth around the bottom to save money. I used hardware cloth on the coop itself so they are secure at night. Boy, is that stuff pricey! Anyway, it is very encouraging to see that the plan is working for you and I can’t wait to get mine finished. Blessings. Yay! Glad this post came at a good time– happy building! Sounds like a great plan, Shanna! I’d love to surround our entire garden with the chicken run. Since I wrote this post, we’ve actually connected the run to the second coop (labeled “GUINEAS” on the drawing above), so now the run spans three sides of our garden. 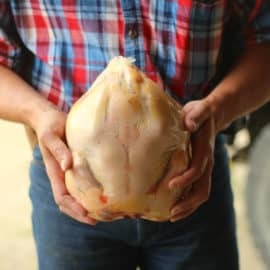 One thing about homesteading and chickens and such is plans that are always evolving! 🙂 Hope your run is turning out awesome! I am very much surprised about this chicken run. 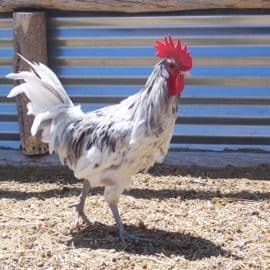 Last few days I try to build a coop but face some problem. I think many instruments need to collect to do something but this is very much natural. Thanks to share, again thanks. Ohh, sorry I am Jenifer from Hickory. Sadly we started with 7 day old Chicks I worried day and night to keep them alive and the day came to wear I sent them to their coop after hearing a crow one morning I knew we had a rooster and 6 ladies. So we put them outside and everything had been great until one night the hatch was opened and 1 hen was lost just before 6 months old so we were down to 6 just this week we lost 2 more hens and 1 body was gone and 1 was left behind head was gone feathers everywhere and the meat was visible. I noticed it early morning and didn’t have time to clean it up before going to work when I came home it was dusk and the body was gone. The eggs are not being eaten just my hens. What animal could this be and how could I find out. This is my first flock and I had bonded to the so closely. If you enjoy free woodworking plans, you will love woodprix. Free is our first name! Get inspired by all the endless possibilities of furniture plans and other wood projects to build, for both indoors and outdoors. Hawks will surely find a way to get in a 4′ open space. They can squeeze through slits a few inches wide and don’t care if they can’t get back out. That’s how we lost our chickens. Broad daylight and WE had to let IT out! Could’ve killed it, it was so trapped but they are protected (and we wouldn’t do that anyway). Point is, don’t take hawks for granted and always securely cover those runs! 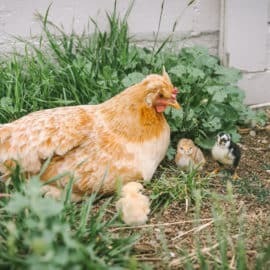 Your advice on raising chickens is very useful, I have learned more knowledge of chicken raising, taking care of chickens is my happiness. Thanks for instructions on building the gate for hen run, we have a badger visiting the garden (uk) and I suspect the foxes won’t be far behind so building an enclosure for the hens.